Yesterday afternoon, Motorola’s plan to launch a full print-ad campaign was detailed for the world. 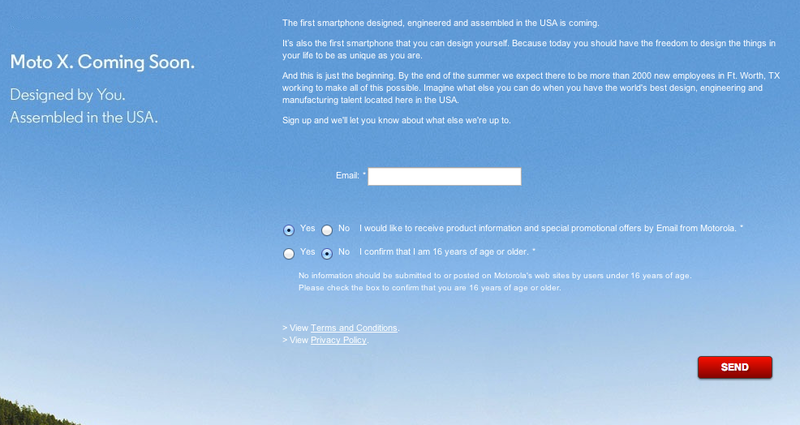 In a tweet sent out this morning from the official Motorola account, a sign up page for additional info on the Moto X phone has gone live. Once signed up, emails will be sent to you at a later time, allowing Moto to keep you up to date on their newest happenings with the device. Much like we saw in yesterday’s ad, Moto is pushing very hard the concept of “Assembled in the USA,” as well as the fact that the device is “Designed by You.” We still don’t quite know to which extent users can “design” a phone, but it’s still a fun idea. According to the sign up page, Moto is going on a hiring spree for their Texas plant, adding 2,000 people to their workforce. Snapchat Updated With New Interface, Enhanced Camera, "Dancing Ghost"